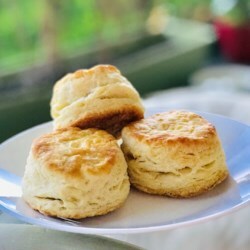 The perfect biscuit recipe! Only change I made was just to use the whole butter stick. The method he uses to work the dough is brilliant. You are not in danger of over working the dough, as that is what makes a dense biscuit, by using the fold and press method. I have made these several times and the taste is wonderful. They bake up light and fluffy. Two important tips that I have learned in making the perfect biscuit. 1) use an up and down motion with your biscuit cutter or glass(whichever you use to cut your biscuits). Using a twisting motion causes the edges to seal and you will not get a good rise. 2) when placing the cut biscuit dough on your baking sheet, place them so they touch one another. This also helps reach a wonderful rise as they bake. I have deemed this the definitive biscuit recipe and my search has ended here. As a matter of fact, I'm making these in the morning since the kids, yet again, have another snow day. And as always... Enjoy!